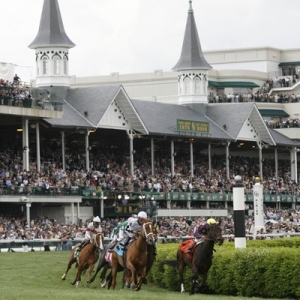 The Breeders' Cup is, for a lot of reasons, the biggest challenge handicappers face every year. The best horses in the world gather together with very different backgrounds and circumstances, and you have to figure out who is going to shine on that particular day. It's not just once, either - it's two days of race after race of brutal challenges. One of the challenges of the day has always been the horses that come over to run in the races from Europe. That typically hasn't been a major hurdle - they are always strong for the turf races, but rarely a major factor on the dirt. That all changed last year, though, when the Breeders' Cup was run on a synthetic track for the first time. Synthetic surfaces, to overly simplify, are more like turf than dirt. They are also a common surface in Europe, so horses there are often more suited to running on them. Muhannak won the marathon on the synthetic surface, but that's hardly a highlight race of the event. What did turn heads, and make life so difficult for us this year, was the Breeders' Cup Classic. Curlin was the heavy favorite in that race, but he was beaten by not one but two Euros - Raven's Pass won, and Henrythenavigator was second. Curlin wound up fourth. Marathon - Muhannak is back to defend his title, but the chances of that are very slim. The race has been extended by a quarter mile, and the extra distance probably doesn't suit him. More significantly, he has been absolutely brutal since winning last year, and really doesn't deserve to be in this race based on form. Despite that, Europe has a very good chances at taking this title again thanks to Mastery. He won the St. Leger Stakes, a major European event, last time out. Conduit won that race last year and then went on to take the Breeders' Cup Turf. Mastery will be one of the most solid favorites on the card. Ladies' Classic - Rainbow View is the sole Euro entry in Friday's main event. Distance won't be a problem as she has run further in the past. She's also entered in the Filly and Mare Turf, and would probably go there if Zenyatta opts for the Ladies' Classic. Assuming that doesn't happen, Rainbow View should go off as about the third choice, and it will be dangerous to overlook her. Dirt Mile - It was long assumed that Mastercraftsman would be headed for the Classic, but he has instead opted for this softer spot. Assuming Derby contender Quality Road opts for the Classic, Mastercraftsman is likely to be the favorite in this race. Sea The Stars, who was recently retired, is quite likely the best horse in the world this year. Mastercraftsman has made a habit of giving him a good chase. He also won on a synthetic track last time out. Other horses will have to be in fine form to beat him. Juvenile - The Euros have an embarrassment of riches in this one - a race that they don't typically bother with. Beethoven has raced a ridiculous amount for a two year old, and looks like he could be losing form. His last win was at 33/1, though, so he can't be ignored as a longshot. Alfred Nobel had a very strong summer, but he seems to be slipping a bit lately. If he wins he'll do it without my betting support. The best of the bunch is Radiohead. His sire, Johannesburg, won this race in 2001. He won the Norfolk Stakes at Royal Ascot in a truly mind-numbing fashion - everything went wrong, but he was determined enough to get the win. He's in tough against some very good American two year olds, but this is usually a wide open race, and Radiohead has to be considered a factor. Sprint - Fleeting Spirit is the lone possibility here. She seems like she would be much better suited for the Turf Sprint, and she has a hard time getting out of the starting gate, so it's hard to see her as a serious contender. Classic - The Euros want to prove that last year's Classic win was no fluke, and in Rip Van Winkle they have a very good shot at it. Last year Raven's Pass won the QE II Stakes in his last start before the Classic. So did Rip Van Winkle this year. The Rating he earned for that win was the second best in the world this year behind Sea The Stars. Zenyatta is likely to be favored if she runs here because she's a hometown favorite and a great story, but Rip Van Winkle probably deserves to be favored. European hopes will also be carried by Twice Over. He's in very good form right now, but it's hard to imagine that his best will be good enough here.